Bina lives in a remote village situated on a spit of land at the crossing of the rivers Brahamani, Hansua and Kharasrota. Her husband is working in Delhi while she is looking after their two children, one boy and one girl. They live in a mud house, on the edge of the Brahamani. It is their third house, the first was lost in the river 15 years ago and the second house had to be evacuated three years ago for the same reason. She stares at the water flow determined to show me the exact location of their previous house when she suddenly says “It’s there! Our second house was right there. There was also some agricultural land next to it but now is all lost” her finger points towards the downriver, her tone is powerful, almost excited. I couldn’t help myself from thinking that I would have been devastated if I was talking about my house submerged by the river but, as she will explain later, environmental challenges are the norm in this area. Something you get used to since you are a child, something you learn to cope with and eventually accept as part of your everyday life. Yet, she admits to fear that the river will also take the house where she is currently living and to get nervous sometimes during flood events especially because she is alone with two children. Soon after the birth of their first child, Bina’s husband migrated to Delhi to work as plumber, a common employment for migrants from Kendrapara whose plumbing skills are notorious. He was previously working in agriculture but when they lost the last of their 4 acres land in the river, and he realised that there was no job in the locality, he decided to migrate. At the beginning Bina was living with her in laws in an extended family “I was the youngest sister in law, thus I was the primary carer and I had to ask for permission to leave the house to my mother and sister in law but it was nice to share things, prepare food and eat together”. Few years and several economic disputes later, her husband decided to separate. Therefore, she is now living alone with her children in a one room mud house made of a tiny little entrance, a thatched roof made of rice straws, one bed and a small shrine for God’s worship. She receives around 4,000 rupees in remittances every month that she uses for the family primary needs and medical expenses, just enough for living without resorting to loans to make ends meet. Joining her husband in Delhi is not an option, it is too expensive for the whole family to live there. He only returns home once a year for 15 days. “What does it mean to be left-behind?” I ask. She looks at me and takes a deep breath “It means to depend on others and to bear the whole brunt of the responsibilities. If my children want something or they are sick I have to ask my brother to accompany me to the market or to the hospital. I often feel overburden. I can’t give my children the time and attentions they deserve”. Social norms impede women from leaving the village unaccompanied, in some cases they cannot even leave the house. For this reason, men usually take care of any activity that takes place outside the village such as shopping for groceries, going to the bank or accompany family members to the doctor. When men migrate women depend on relatives or neighbours to address these needs. I ask Bina if there is any positive in having a more active role in decision-making, especially concerning financial decisions as she manages the remittances. “The positive aspects are outnumbered by the negatives. I have to think about everything by myself, I don’t feel comfortable and I often feel very emotional. Being alone makes you foolish!” she adds “When my husband is here I feel free”. I left Bina with many questions still floating around in my head but it was almost lunch time and she had to start cooking. She made me think about the socio-psychological impact of migration, especially when it is so gender biased. 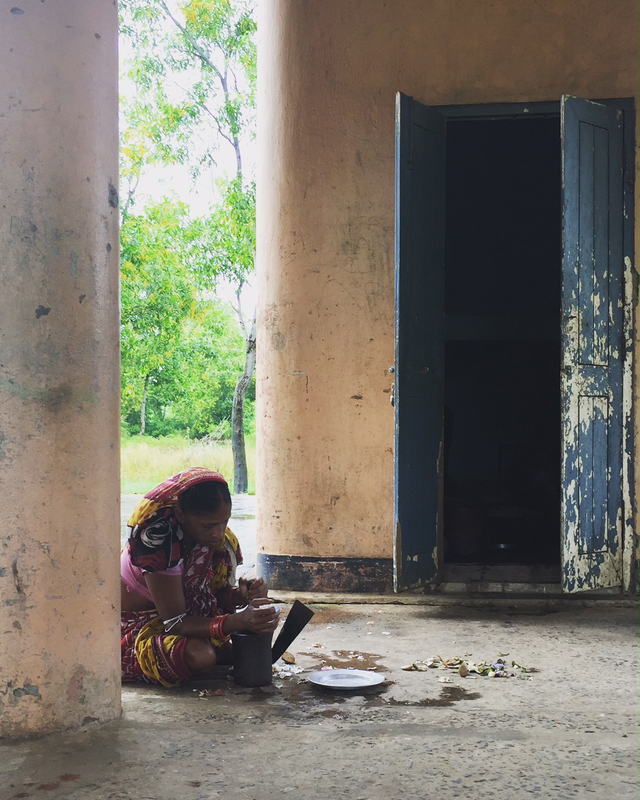 In Kendrapara, a coastal district of the Mahanadi delta, sociocultural norms restrict women’s mobility and access to paid work resulting in larger numbers of women left behind by migrating husbands, brothers and sons. Trapped in challenging environments and disadvantaged by unequal gender and power relations they brave life alone in patriarchal societies where most activities are dominated by men. This often implies having low or no access to assets and services (i.e. credit, capital, livelihoods) and a very low bargaining power. Their strength and ability to thrive and take care of the household despite the difficulties is astonishing but I was also taken aback by the psychological bearing. Although there are differences in terms of exhaustion, mobility and power, depending on factors such as their kinship, age or the household composition, an almost common trait is a sentiment of unhappiness, resignation and loneliness. Migration is accepted for the sake of the family wellbeing or, in most cases, survival but it is very rarely reported by women as an optimal choice. As I was leaving Bina’s house she took my hands and said “Even if I want my husband to return, I know that we don’t have any other choice. I want my children to study and have a better life. What can I do? I hold on and when I’m desperate I cry. I don’t share these feelings with my husband, he is there to work I don’t want to upset him”. She then went to collect the rice straw for cooking, there are still so many things to do until dusk that there is almost no time for her to think about the future. *Bina is a fantasy name used to protect the privacy and anonymity of the respondent. Inequalities are omnipresent within Indian rural communities. They are perpetuated by the system of castes, which leads to a social stratification of India’s population. Moreover, vulnerability to external stresses is also driven by gender discrimination, which follows on from the systemic marginalisation of women and the differences of power relationships that exist between men and women, especially in India. In order to get an overview of communities, social scientists have to face the challenge of getting access to the views of such marginalised groups. This blog presents some of the methods I implemented to address this issue during a research fieldwork conducted in the Mahanadi Delta in India during winter 2016. As part of our work associated with the characterisation of livelihood dynamics under the threat of external stresses, we’ve conducted an in-depth fieldwork in the Mahanadi Delta in India. First, the fieldwork team interviewed members of governmental agencies, NGO representatives and academics in Bhubaneswar. Then, the team spent 6 weeks conducting Participatory Rural Appraisals (PRAs) in 10 rural communities in the Districts of Nayagarh, Puri, Jagatsinghpur and Kendrapara, spending 2 to 3 days in each community. Participatory Rural Appraisal (PRA) was chosen as the main method for creating primary data as it enables rural communities to share, enhance and analyse their knowledge of life and condition. Different activities were used to cross-check the data collected and to cover all the aspects of livelihood systems, such as wealth ranking, seasonal calendar or community mapping. The PRAs were conducted by one researcher with the help of a translator and a facilitator who were trained before conducting the activities. The researcher monitored the evolution of the PRA and provided guidance to the translator and facilitator. Focus groups conducted for each PRA activity were purposely held separately between men and women to capture gender differences and to give women, who suffer from a lack of recognition in India, the opportunity to express their opinions and issues. It enabled the women to express their opinions in an environment free from the power pressure of men, focus groups being conducted by a female translator. In some communities, implementing such an approach raised discussions amongst men, many arguing that “women should not be consulted because they don’t know anything”. This example of the social pressure existing between genders was also felt between castes and we also conducted PRAs with Scheduled Castes (SCs) and Scheduled Tribes (STs) separately. This enabled us to gain access to the opinions of women and socially marginalised groups. However, we were also confronted to the ‘habitus’ of social stratification: even with homogenous groups of socially marginalised groups (women, SCs/STs), it appeared to be sometimes difficult to animate the focus group and to co-create the primary data. This lack of participation can be explained by the fact that such groups cannot express their opinions within the community and this pressure remains during focus groups. In order to get round this issue, we decided to add another activity during the PRAs. This activity, called photovoice (www.photovoice.org), is a participatory visual method that uses photography to initiate discussion within the focus groups. After a one-hour training course and the identification of a theme (“household and community assets that are important for their livelihoods), participants were given a camera each for two days so they could document the theme. After the two days, we met in a focus group to review the photos and discuss them. This method was a real success and marginalised participants (women, SCs/STs) got very involved. It led to very interesting discussions that had not been tackled within the previous activities and was a successful way to get the opinions of such groups out. As a conclusion, it is necessary to extend the range of methods used in social sciences in order to capture the diversity of opinions that exist across the different social stratum within communities. As an example, we successfully used the visual method Photovoice to initiate discussion and get the opinion of marginalised groups such as women and scheduled castes and tribes. The challenge now is to integrate such methods in vulnerability assessment and to take such groups into account in the design of public policies. From predicting traffic to budgeting monthly expenses, mental models inform everyday decisions by relating possible conditions (e.g. number of cars) to expected outputs (e.g. delay length). As with computational models, mental models are continuously updated as new information comes to light. Consequently, no two perceptions of the world are the same, shaped by individual experiences of interpersonal relationships, culture and the environment around us. Mental models have played important roles in the history of Chilika: a 1000 km2 coastal lagoon in the Mahanadi delta, India. For instance, it was hoped that the legalisation of shrimp aquaculture in 1991 would bring economic prosperity by diversifying local livelihoods and boosting annual fishery production. Instead, benefits were reaped by non-native aquaculture entrepreneurs, triggering cultural and socio-economic instability. The institutional settings soon adjusted, largely due to local pressures and scientific contributions of the newly formed Chilika Development Authority (CDA), leading to the banning of shrimp aquaculture in 2001. Mental models also prompted studies of Chilika’s sediment dynamics in the 1990s, resulting in the new tidal outlet which has since increased fishery productivity 10-fold. Going forward, a balance exists between the institutional-led discouragement of juvenile catch and the desires of some fishers to maximise hauls. I (very excitedly) travelled to Chilika in early 2016, hoping that both my mental and system dynamics model (SDM) would benefit from exposure to the system and its people. Until February 2016, my SDM was projecting future fishery production from empirical data and published work only. Interviews could tap into decades of experience working, living and ‘dancing’ with the system, as the pioneering system dynamicists Donella Meadows would say. I concentrated on how Chilika’s fishers, scientists and governors perceive the causes of the 1990s collapse, the subsequent recovery and the lagoon’s future. I also hoped the insights would help model evaluation and provide governance scenarios for simulation. In practice, various barriers exist to integrating qualitative data into SDMs. For example, SDMs assume lumped populations making the same decisions, different to agent-based modelling which can simulate individual decisions. Yet workarounds exist, like disaggregating populations and/or estimating proportions making a decision for a given condition. For example, the former principle splits Chilika’s fishers into traditional and motorised fleets, associated with different fishing schedules and catch capacities; the latter workaround estimates the proportion of traditional fishers purchasing motorised boats for a given average income. Furthermore, interviews may provide a quantity of opinions which cannot all be incorporated into the model’s finite structure. Therefore, it is useful to consider the rationale bounds of each stakeholder to understand how each mental model is shaped. Regional scientific experts may possess holistic system understanding, whilst fishers live and breathe the conditions important to their activities. Prior to the interviews, I was debating spatially disaggregating the fisher population into northern, central, southern and outer channel fleets. But from the fisher interviews I learnt northern sector fishers commute south to exploit the relatively abundant fish stock, dispelling my preconceived idea that fishers rigidly stick to their locality. Overall, the field visit exposed me to different qualitative insights not acquirable from my desk. Understanding that traditional fishing communities may collectively begin using motorised boats when socio-economically favourable has highlighted how fishers adapt to intensify practices. Paradoxically, fishers exhibited environmental stewardship during the 1990s collapse by limiting their days fished, doing their bit to calm extraction stresses. And finally, discussions with state and district level policymakers helped design feasible management approaches to test within the model (e.g. continued ecological restoration, bans, alternative livelihoods). The issue of policy implementation and adherence was continuously stressed, meaning any policies simulated in the SDM must be framed as ‘if all fishers complied with regulations, the resulting dynamics may be as follows…’, which is important for model design and scope. A big thank you to all who shared their mental models with me! The TransRe conference (Connecting the Dots: Migration. Environment. Resilience, 29 – 30 September 2016, Bonn, Germany) was organised to mark the half-way point in the TransRe project: Building resilience through translocality. Climate change, migration and social resilience of rural communities in Thailand. Over 60 participants from various countries engaged in highly stimulating debates. A really interesting range of research on the links between climate change migration and resilience were presented from multiple perspectives. The range of presentations included talks on meta-theoretical considerations, empirical evidence, governance and policies, methodological approaches and linkages between migration and changes in socio-ecological systems. In the conference opening speech, Koko Warner, from the UN Climate Change secretariat (UNFCCC), highlighted the need to expand the discussion on migration, adaptation, environmental change, and social resilience beyond the confines of academia given the wider relevance of these topics. Three DECCMA researchers presented their ongoing work at the conference. Helen Adams (King’s College London) called for a closer examination of the definition of success when thinking about the role of migration as an adaptation to climate change. Ricardo Safra de Campos (University of Exeter) presented initial findings on the mutually beneficial relationship between adaptation and migration intensity at household level. Attila Lazar (University of Southampton) colleagues introduced the conceptual design of the innovative and comprehensive approach taken by DECCMA to understanding migration and adaptation employing Bayesian Belief Network model. In addition to the oral presentations, Tuhin Ghosh (Jadavpur University) submitted a poster on the characteristics of migration in climate hotspots focusing on Satjelia island in the Indian Sundarban Delta. The conference showed how well placed the DECCMA project is to contribute to current debates on migration, adaptation and climate change. Several of the talks emphasized the need to consider spatial and temporal scales, consider migration as one of many processes ongoing as a result of wider processes of development, and to, naturally, consider the multiple sites of migration. DECCMA by definition of its sending area and receiving area surveys takes a translocal approach. As such there are opportunities for collaboration and synergy. There are other international projects on migration – TransRe itself, and others such as Migration, Environment and Climate Change: Evidence for Policy (MECLEP) at the University of Liege. The perspective of translocality propels the environment-migration nexus debate forward to explicitly recognise the complexity and richness of mobile human existence, and move beyond a focus of linear migration trajectories of people escaping negative climate change impacts. Several presenters suggested that upcoming studies should also focus on both immobile and trapped populations. Other important discussions on conceptual challenges around successful migration, and migration as adaptation were also part of the agenda of the conference. More specifically, the talks, and especially the key note from Jonathan Rigg, highlighted the need to keep migration as one of the many socioeconomic and demographic transformations that are occurring in rural environments, and which tie to wider development debates. These themes will continue to be investigated by DECCMA as the project advances. Join the Stockholm Environment Institute and partners at an international scientific workshop that will examine the emerging complexity of climate adaptation governance with all its commensurate new forms and consequences. The workshop will be an intimate two-day event held in Stockholm on 23-24 May 2017, with themed sessions discussing research papers and policy-maker perspectives. Professor Sam Fankhauser (PRISE Co-Principal Investigator) and Dr Declan Conway, from the Grantham Research Institute on Climate Change and the Environment launched their new edited volume ‘The Economics of Climate-Resilient Development’. The book treats adaptation to climate change as an issue of climate-resilient development, rather than as a bespoke set of activities (flood defences, drought plans, and so on), combining climate and development challenges into a single strategy. It asks how the standard approaches to development need to change, and what socio-economic trends and urbanisation mean for the vulnerability of developing countries to climate risks. Combining conceptual thinking with practical policy prescriptions and experience the contributors argue that, to address these questions, climate risk has to be embedded fully into wider development strategies. The book is available to purchase through the publisher here and a discount is available here. DECCMA team members Dr Andres Payo Garcia and Dr. Craig Hutton (Southampton University) attended and presented on ESPA Deltas at the recent American Association of Geographers in the city of Chicago, USA. The meeting session was organised by Cologne University in Germany and Ohio State University who have been collaborating on a project called Band-AID (http://www.belmont-bandaid.org) which is of direct relevance to DECCMA and operates a small number of case studies within the DECCMA study site in Bangladesh. The intention of the Band-AID project is to build a robust Belmont Challenge identified Earth System Analysis & Prediction System (ESAPS) for Bangladesh, to adapt/mitigate the detrimental hazards including sea-level rise. We will establish an advanced observation system based on contemporary space geodetic sensors to quantify (1) causes of sea-level rise and land motion and their robust vertical datum link, and (2) human interactions that governs coastal vulnerability in Bangladesh. Additionally a highly relevant project called ISEE Bangladesh lead by Vanderbilt University presented on materials from a small series of detailed studies, some of which occurred in the DECCMA study site. ISEE aims to (1) identify social and environmental factors most important in maintaining stability, from households to communities, or for motivating decisions to migrate; (2) determine how these factors differ within and across diverse social and physical landscapes; and (3) assess how these variables are likely to interact under a variety of scenarios for social and environmental change. In addition it has extensive data on community governance and has carried out a series of ethnographies to this end. ESPA Deltas presentation demonstrated the broader contextual approach it has undertaken and during a dedicated post session meeting, there was a general consensus that there is a good potential for the projects to develop a high quality paper linking historical land use change with changes in governance typologies, which would be highly informative to DECCMA also. To this end there will be a joint meeting of the projects on June 18th at the University of Southampton with some 10 researchers involved, where a strategy for the development of the research will be further developed. This is an excellent example of projects cooperating to mutual benefit and to produce a synergistic outcome of value to both the research community and within a joint study site.